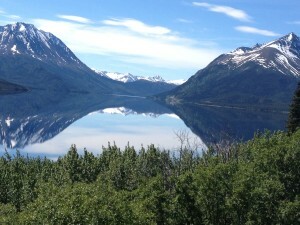 It took me three weeks and approximately 1915 Km’s, starting from Anchorage, to reach Skagway. A total of 18 days on the saddle, excluding the rest days in Fairbanks, Delta Junction, Destruction bay and Whitehorse (10days in Alaska and 8days in Yukon). 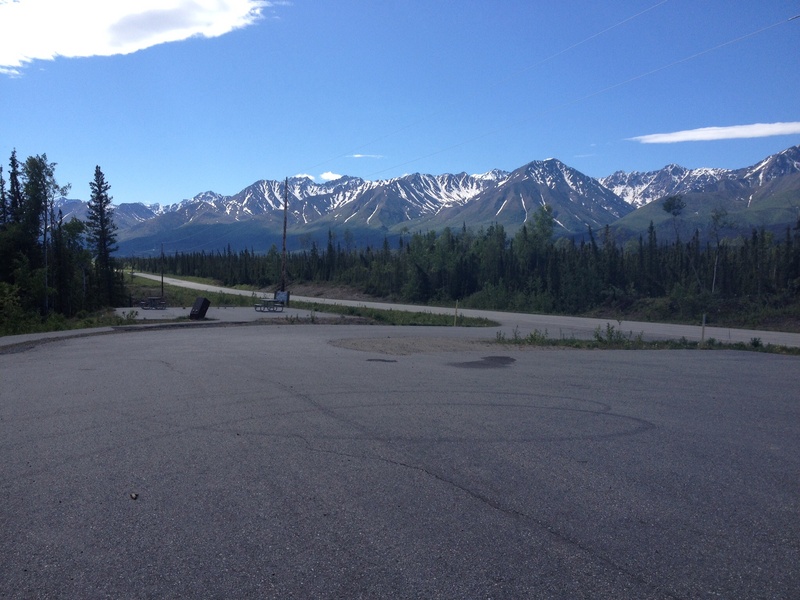 In the Yukon, most of the time I was the only one on the road, an ideal condition for road cyclists. 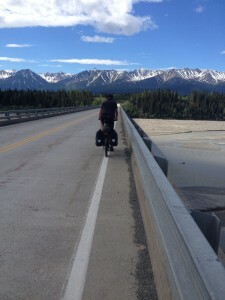 The longest distance I cycled on a single day was between Haines Junction and Whitehorse, 100 miles. I was not sure if I would be able to do this, considering the heavy trailer on such strenuous terrain (total elevation gain for the day was xxxxx) however I succeeded, it took me 10 hours. At Delta Junction in Alaska, I met a German couple, Holger and his wife, who are cycling to Ushuaia too, but on a shorter timescale than I am. 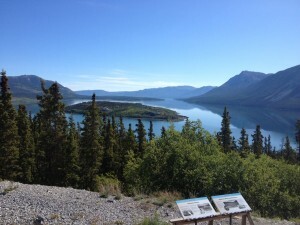 I rode with them for two days until Tok, after which they went to Dawson City while I continued on the Alaska highway. I was glad that I had some company. We cycled 62 miles to Dot Lake on the first day and camped next to a school. We were warned by the locals about a mother and baby bear that were spotted in the area. During the night, I heard the dogs barking but I was too lazy to leave my tent. Holger suspected some visitors during the night, possibly the bears, but luckily nothing happened. After Tok, I was cycling on my own. After 4 days of cycling from Delta Junction, I crossed the border to the Yukon. Canada welcomed me with rough roads. 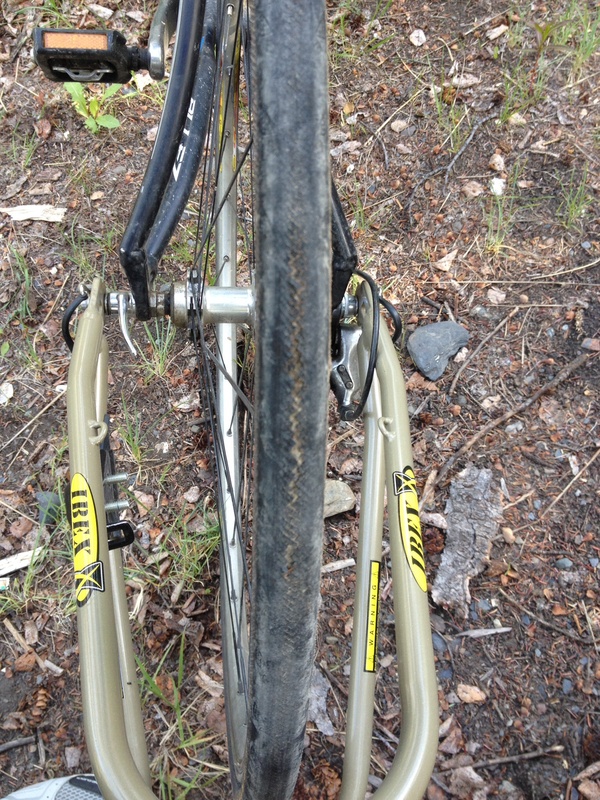 There were several long stretches of roadworks and even when there was no roadwork, the Yukon roads weren’t good for my road bike tyres. There was no tarmac for most part and it was as good as riding on rough gravel. These stones chewed my tyres (see the picture). However, the Gatorskin tyres were able to take this. 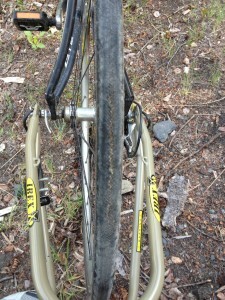 I only had one puncture in spite of riding on those rough roads for several days. I met some cyclists going on the opposite direction, some of them were coming up all the way from Argentina (Ronnie and Linda; Alex)! It was exciting and inspiring to meet them. 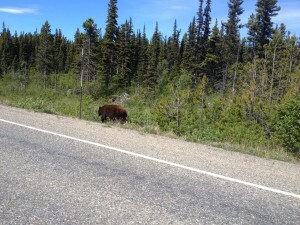 I got over the fear for bears and started wild-camping, although I slept with my bear spray next to me. One day on the road, a camper van slowed down to speak to me. The driver asked ‘hey did you see the fox that was behind you?’ I said, ‘a what’ and he replied, “yeah dude, there was a fox behind you and we thought it was your dog!” I am glad I did not notice the fox, that would have caused unnecessary panic. I saw a bear once, but it ran away when a car drove by. I saw another one on my last day in the Yukon. It was quite a poser, it didn’t mind people taking pictures. I took the courage, on the assumption that I could jump into one of the cars that were nearby if it charges, and went to get some close-up pictures. It was all jolly good, the bear went to have a dip in the pool and then ran away. Whitehorse is the capital of Yukon province, out of 35000 people in this province, 25000 live in Whitehorse. For a small city, there were many events happening in the city on most days. 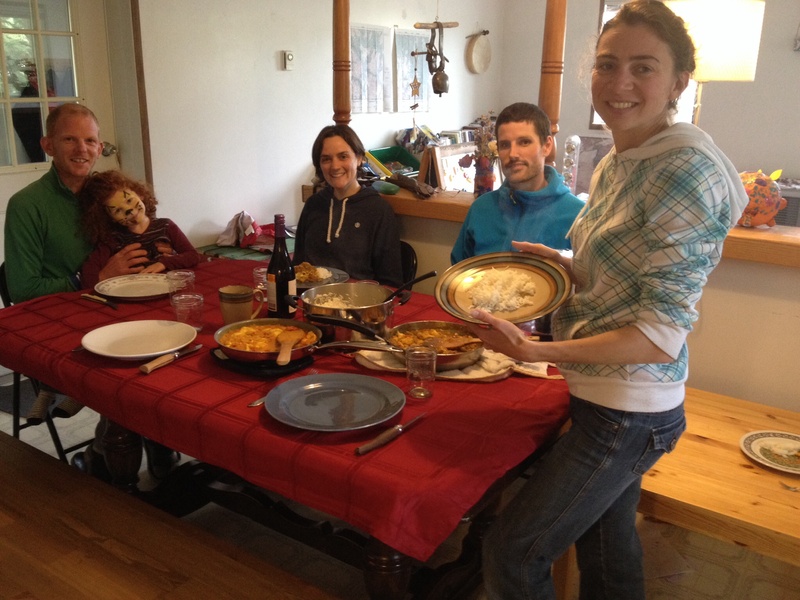 In Whitehorse I stayed with Warmshowers hosts who spoiled me with coffee, cheese, chocolate and lovely French meals. Jerome, Nelly and their daughter Josephine were very kind. 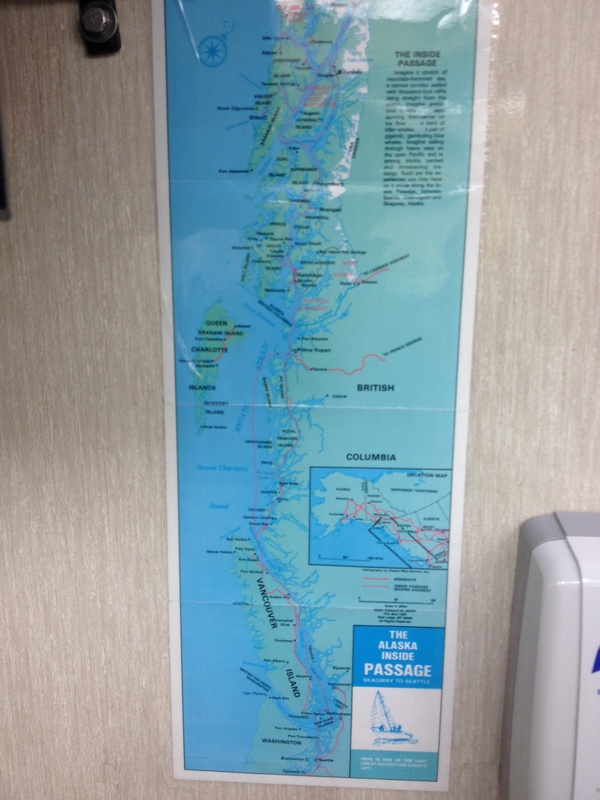 They had cycled from Argentina to Peru in the past and were, and likely are; still itching to get on their bikes. They had their friends over one day and we all had a great time. Jerome helped to move my website from google sites to wordpress – I was hoping to do this at some point and this would have taken several days, but Jerome did it in just a few hours – Thanks Jerome. It was hard to leave them. 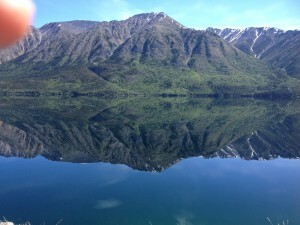 On my last day of cycling in the north, I had brilliant weather; clear blue skies and some amazing scenery, the reflection of the mountains in the lake made for some lovely pictures (posted here). 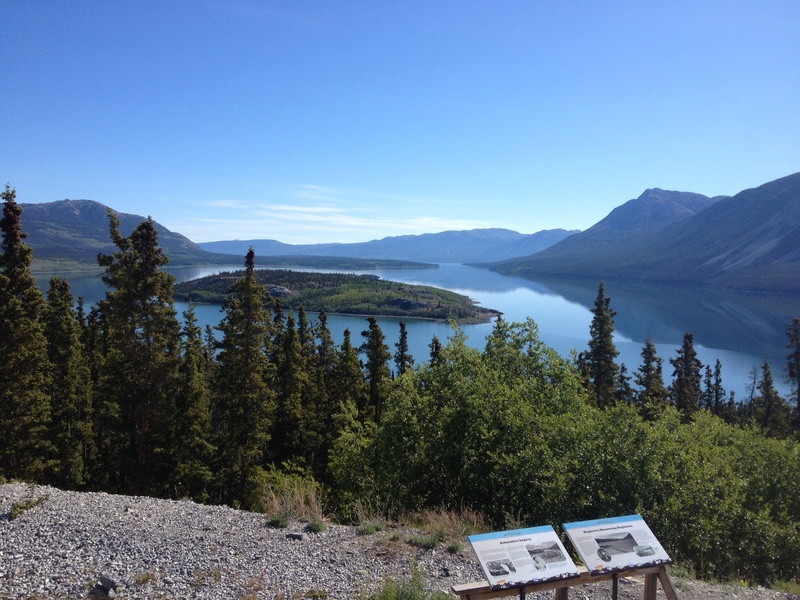 It was a hard climb to the top of the summit (900 metres) followed by a lovely downhill ride for about 10 miles to Skagway (sea level). 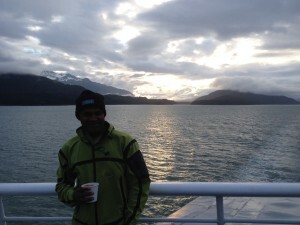 In Skagway, I stayed in a youth hostel, Skagway Sojourn hostel where I met some more travellers. Janelin, the lady who ran the hostel was very kind and super friendly, she spoke to William to sponsor my accommodation for the second night, William Cogswell from Maine, was an English teacher at a high school, a long conversation followed, all about high school teaching in the USA and UK. I cooked a fish curry for Janelin and William to thank them. The third night of my stay in Skagway was with a Warmshowers host, Robert who had cycled in India. His housemate Grant found a place for me too stay in Bellingham (networking helps!). I cooked veg curry for Robert and Grant. During the Klondike Gold Rush, an event when thousands of men and women on hearing the news of gold discovery, rushed to Alaska to dig their share of gold. Skagway was the port of entry on the poor man’s route and they had to trek a long distance, which included the famous Chilkoot Trail and White Pass. The rich man’s route ferried them quite close to the site. I found the history of this event quite interesting and it raised many philosophical questions in my mind. Along the way I met a small team comprised of 7 members. 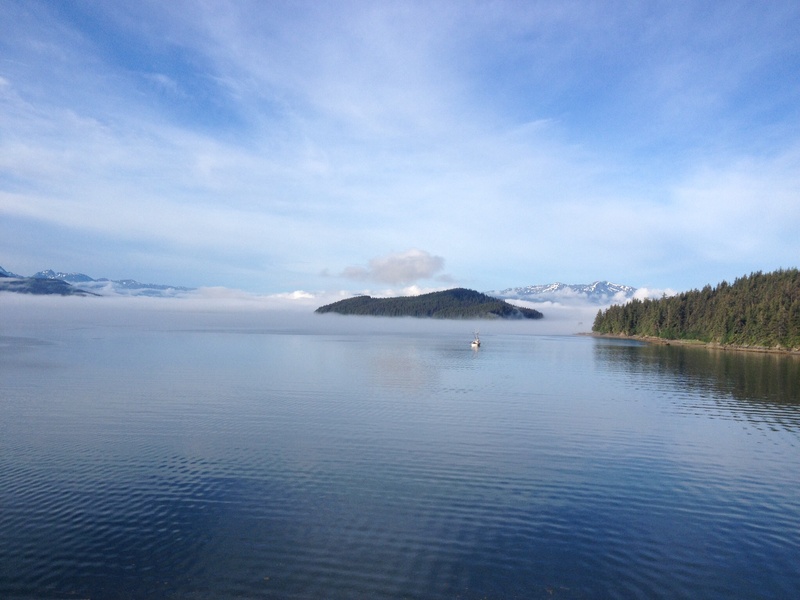 They were situated in Destruction Bay, digging in search of gold, luckily with permission from the government. I wondered why large mining companies haven’t taken notice of this, but I couldn’t get an answer for this. At campsites and along the road I have been meeting lots of people and sharing my adventure. 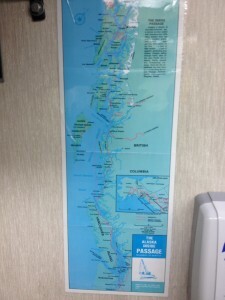 The kindness of strangers continues: one day when I stopped at a rest area on the side of the road for a snack bite, Carol asked if I would like a sandwich, I had no hesitation, I said ‘that will be nice’ – I must have been very hungry. Her husband also gave me several energy bars, energy chews, and some dry fruits too. I was blown away by their kindness. I thanked them and took a pic of them pumping up my bicycle tyres. Janelin at The Sojourn hostel in Skagway, and William Cogswell who sponsored one nights accommodation at the hostel so I could stay with a roof over my head for a second day; Ted and his wife paid for a lovely breakfast in the ferry to Bellingham. My philosophical inquiry about these seemingly random acts of kindness continues and I hope to come up with a hypothesis at the end of my trip, even though social science is not my specialisation. I have been cooking Indian food for my Warmshowers hosts using the spices that I carry with me. I get lovely feedback for the same and I hope to continue this for the rest of my trip. At Tetlin Lake campground it rained the whole evening and night. I cooked something to eat at 1030pm when the rain stopped briefly. My tent held out against the rain very well. Although I saw water running underneath my tent which told me that I needed to identify better spots to pitch my tent. Even though on some days it’s below 5 degrees C in the mornings, I had to grit my teeth and get out of my sleeping bag. It reminds me of how soft I have become over the last two years years; I think, only when you are challenged you realise your capacity. I did not expect this bike tour to be a walk (or ride) through the park, but expecting and experiencing are two different things. I had rain, cold mornings, punctures, rough roads, cloudy and windy weather – conditions that are perfectly natural, but are on the other side of pleasure, after all pain and pleasure are relative. 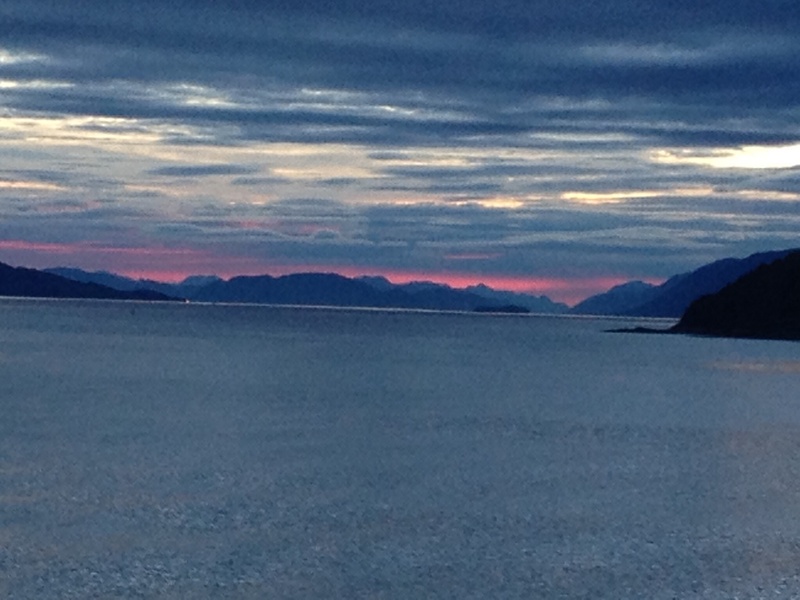 From Skagway I took the ferry to Bellingham, Washington. I had to abandon my plan to cycle through the Rockies in Canada since US visa waiver allows only 3 months, which would include my stay in Canada too. I have promised myself another visit at some point in the future to cover the Rockies. 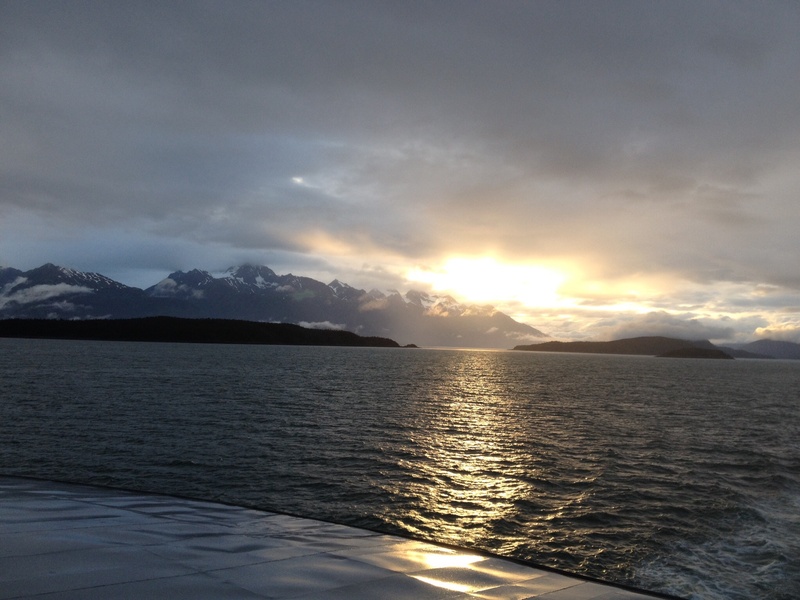 The three days ferry ride from Skagway, Alaska to Bellingham, and Washington was worth it. The ferry goes through the route known as the ‘inside passage’ through the Alaskan and British Columbian islands which make for some spectacular scenery, especially the sunrise and sunset, when all the cameras come out. Clouds on the surface of the ocean! 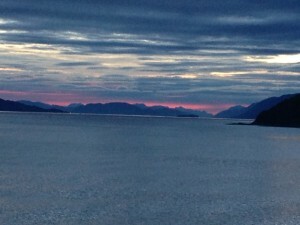 I thoroughly enjoyed my time in the north (Alaska and Yukon). It was an eye opener in many ways. The vastness and wilderness of the landscape along with the kindness and openness of the people has left me wanting more, hopefully I will return at some point. In the coming weeks I plan to take the pacific coast route that goes right next to the sea in the west coast of the USA from Vancouver to San Diego. I also have separate pages on my website for route map and gear list.